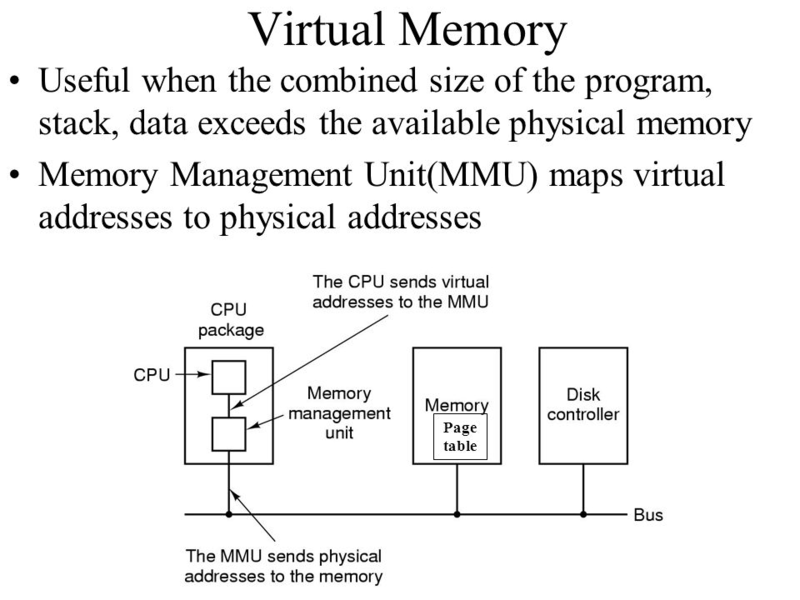 In nutshell, as I understand memory management, processor produces virtual addresses. These addresses are translated to corresponding physical addresses using per-process address table by MMU (with TLBs and page-faults in-between, as and when needed). My question is does processor always produces Virtual addresses? In terms of Address-spaces(user/kernel), Processor modes (user/kernel) and contexts (process/system) when all times does processor produce physical addresses? Memory typically knows nothing about virtual addresses or segments, which are CPU concepts, it is just memory, a collection of addressable and readable/writable bits. The processor talks to memory using physical addresses. Many simple processors (especially old ones or for special embedded uses) have no MMUs, virtual addresses or privileged modes. Those that have MMUs and virtual addresses normally start either with those disabled or they at first use fixed mapping because otherwise nothing would be able to work if there's no mapping at all. So, physical addresses are always in use, while for virtual addresses it depends on the CPU and the software in use. Processor is unaware about whether it is physical address or virtual address , it is the job of respective MMU to do the translation. Processor has to place the address on it address bus , so now the path depends whether MMU is enabled or disabled. if MMU is enabled it will follow the path of MMU translation and respective physical address will get placed on address bus and if MMU is disabled the same address generated by respective instruction will be placed on address bus. Yes when a system works on VM then instructions/programs produce only VA even at the time of booting, addresses generated are not the same as physical despite page tables are still not in existence. physical: the actual addresses that are used to select the byte in memory. Used for things like segment base addresses, interrupt descriptor table, global descriptor table. logical: these are addresses that you use most of the time when paging is disabled. They're converted to physical addresses by adding the respective segments (physical) base address. virtual: the addresses used by most instructions when paging is enabled. These are translated into logical addresses using page directories and tables. Which kind of address is used isn't dependent on the current privilege level (CPL; "system mode", "user mode" or between). It depends on the state of the processor (paging enabled or not) and the actual instruction (lidt for example). Though I guess it's safe to assume that there won't be physical addressing in "user mode" (CPL > 0) since instructions using physical addresses are usually privileged instructions. Generally the CPU ONLY knows "virtual addresses". Ie, when you do any assembly programming, any "load regs, *(memory ptr)" or such-like operation, the addresses are virtual addresses. Any addresses coming out of CPU, is always virtual. But if the processor has a MMU, then the MMU will intercept the addresses and convert it to physical addresses (through Page Table mechanism) before putting it on the memory bus. So if you sniff the memory bus, you will see physical addresses. Not the answer you're looking for? Browse other questions tagged linux memory memory-management operating-system processor or ask your own question. Kernel memory (virtual address entries) in TLB? Are addresses in x86 assembly virtual or physical?